The Pasquotank County Center is conducting a recertification class for pesticide applicators on Tuesday, October 30, 2018, from 8:30 a.m. to noon. This class will provide 3.5 hours of commercial pesticide applicator credits for the categories of Aquatic (A), Public Health Control (B), Dealer (D), Forest Pest Control (G) Right-of-Way Pest Control (H), Regulatory Pest Control (I) Agricultural Pest Control – Animal (K), Ornamental and Turf Pest Control (L), Demonstration and Research (N), Agricultural Pest Control – Plant (O), as well as 3.5 hours of X credits for farmers. Entitled “Emerging Pests, Resistance Management, and Hard to Control Pests” this class will provide information on pests that pesticide applicators need to be aware of that that they currently do not know much about, the various aspects of resistance by pests to pesticides and how we can prevent it from occurring as well as identify it if it does occur, and hard-to-control pests that pesticide applicators may be confronted with. If you are a commercial or private (farmer) pesticide applicator and need recertification credits, then make plans to join us at the N.C. Cooperative Extension, Pasquotank County Center on Tuesday, October 30 starting at 8:30 a.m. Please RSVP to cpboyce@ncsu.edu or call 338-3954. Also, the credits available for this and other pesticide recertification classes can be found via the Course Calendar. 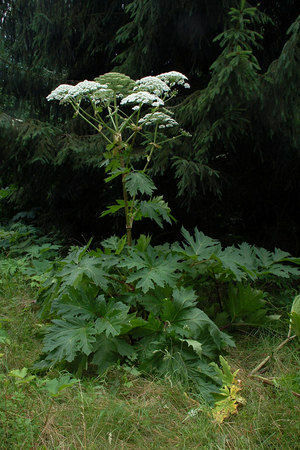 An emerging weed pest that pesticide applicators, farmers and others need to be aware of is giant hogweed. This is just one of the emerging pests that participants of the pesticide recertification class will learn about.